Hatters boss Nathan Jones hasn’t set himself a target of wins needed to secure promotion to League One this season. Going into the final 13 games of the campaign, Luton find themselves top of the tree on 67 points, five clear of Wycombe in second and a further eight in front of fourth placed Mansfield with a far superior goal difference too. 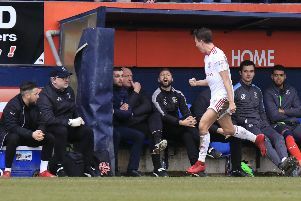 Last season, 78 points was enough to go up after Luton were fourth on 77, although the two seasons prior to that, 85 was required to do the job. On the run-in, Jones said: “Six wins means we get to 85, I’ll be happy if 82 is enough, because I think that’s very reachable for us, considering where we are now. “Last year we finished fourth on 77, so 78 would have been enough, but you just don’t know. “We’re not looking at that yet, we’ve not got a points target. "We’re looking at the next game, and then I think when we’ve got through half of these games, with six left, you’ll know what’s needed and things like that if you’re in that privileged position. “We’ve got to make sure that we come through this period, we’ve got a big month coming up, this (Cheltenham) finishes off the month, it’s a real big group of games coming and we’re looking forward to them. “If we don’t get promoted, it’s because of something has happened between now and then. “We’re in a wonderful position, we couldn’t be in any better position, realistically. “We’ve got a fantastic squad, we’re in good form, very good form, some are in exhilarating form which has meant that the gap closed. Although there is still a big chasing pack for the automatic promotion places, Jones isn’t too fussed by what’s going on behind Town, with matters in their own hands. He continued: “There are lots of teams, we know that, but not everyone can get to a certain figure. “So as long as we keep going, we’re in good form, in good shape and I’m happy with where we are, that’s all I can affect. “We’re not apprehensive, we’re not fearful, we’re actually looking forward to it. "It’s a good place to be in, I’d rather be in this position than where we were last year and we thought we were in a good position last year." Although Town will have had 10 days off as opposed to today's opponents Cheltenham, who were in action last Saturday, losing 2-0 to Wycombe, Jones think the break won't adversely affect his players. He added: “What we did was we purposely left the debrief from Tuesday to Monday so we can switch them back on again. “They’re a good group, I don’t think I need to tell them what’s at stake and what we need to do and so on. “We never look and think ‘if we win this and we go to Cambridge,’ we don’t. We have had a good lead-in to Cheltenham, we’ve had a good week of training, we’ve prepared well, done a lot of tactical work and will sharpen them up before the game.